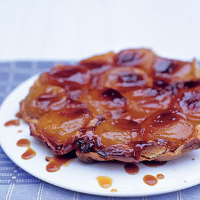 This sticky, upside-down tart is, for me, the most sensuous pudding in the world. Butter and sugar do wondrous things to apples, creating a rich toffee that mingles with all their tart juices – and then there's the way that cold pouring cream glides over the glossy apples and sinks into the crisp pastry. The crinkle-edged pastry that catches all these glorious drips is traditionally a rich shortcrust, and mine is almost shortbready in texture. Puff pastry is slightly easier to handle, and has a flakier, lighter feel, but can go a bit soggy. Tarte tatin tastes best warm, not hot. Let it sit; allow the flavours to mingle and the juices to thicken. This thing of beauty was born of an accident. It was a busy day during the 1889 hunting season at the Hotel Tatin in the French town of Lamotte-Beuvron. In the kitchen, Stéphanie Tatin was distracted. Her apple pie went all wrong; for the hungry huntsmen, it went all right. Begin by making the pastry. Sift the flour and icing sugar into a large mixing bowl or food processor. Add the butter. Using your fingertips, rub the butter into the flour, or pulse the ingredients in the processor, until the mixture resembles breadcrumbs. Mix the egg yolk with 2tbsp water, then, using a blunt knife, stir just enough of this mixture into the dough to make it come together. Wrap the pastry in clingfilm, pat it down into a flat disc so that it will be easier to roll out later and place in the fridge for 30 minutes to chill. To make the filling, spread the butter over the cold frying pan and sprinkle the sugar over the top. Place the apples around the edge, rounded-side down. Tilt them slightly, allowing them to overlap, as they will shrink later. Place over a low flame and cook for 10 minutes so the sugar dissolves slowly. Once it has dissolved, turn up the heat to a medium-high flame and cook for 15–20 minutes, occasionally giving the pan a light shake to prevent the apples burning. The juices will start to turn a gloriously rich, amber colour. Move the pan around on top of the hob to make sure they colour evenly. Be brave. You want the apples to hold their shape, but you also want the juices to darken to a colour that will give the tart that rich caramel flavour with a slight hint of burnt sugar. Think mahogany. Take the frying pan off the heat, scatter with the lemon zest – a must to stop it being too sickly – and allow to cool for 10 minutes so the pastry doesn't melt. Preheat oven to 200°C, gas mark 6. Remove the pastry from the fridge and roll out to a thickness of 3mm on a lightly floured surface. Using a dinner plate for guidance, cut out a 20–25cm circle (the same size as your pan). Lift this onto your rolling pin and place over the apples, tucking in the edges. Patch together any cracks that appear. Place on a baking sheet to catch any drips – cleaning burnt caramel off the oven is no fun – and cook for 25–30 minutes until the pastry is golden and feels dry. Remove from the oven using proper oven gloves – the sugar will be dangerously hot – and let it sit for 10 minutes. Run a knife around the edge to loosen any stubborn bits of caramel or pastry – don't worry if some of the pastry crumbles here. Place a large plate over the top and, holding the plate and pan with oven gloves, quickly flip the whole thing over so the tart ends up on the plate. If any apples are left in the frying pan, simply scoop them out and replace them on the tart. You can serve it as it is or – surely the way God intended – with double cream or ice cream.